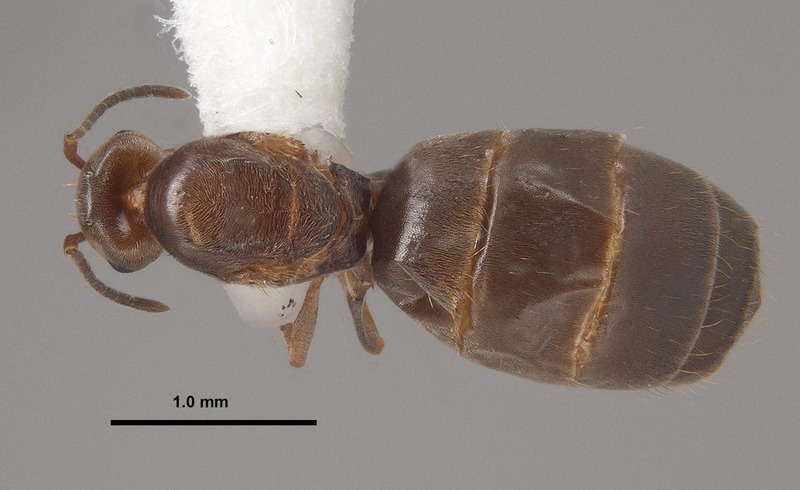 Brachymyrmex is a New World genus whose members are minute, soft-bodied, have a small petiolar scale, and a nine segmented antenna without a club. Workers have well developed eyes. Color ranges from pale light-yellow to dark brown. Species is this genus usually nest in soil or rotting wood. Brachymyrmex species can be identified by their one-segmented petiole, the presence of an acidopore, and their nine-segmented antennae. Brachymyrmex patagonicus Mayr (Formicinae), the dark rover ant, is a minute dark brown species with pale tarsi and mandibles and brownish-yellow antennae. The promesonotum usually has at least four erect hairs. The gaster has sparse, but rather long pubescence. The head is slightly wider than long. The eyes are relatively large; about as long as the length of the malar space. Minute ocelli are lacking, but some large setal sockets may give the impression of ocelli. The scape obviously surpasses the occipital border. This native to the Argentina and Paraguay has become widespread in the southeastern US and has expanded its range into isolated locations in the Southwest and California. A word of caution, this group is in need of revision. This particular species has been identified as both B. musculus Forel and B. patagonicus for the last 30 years since it was first reported to occur in the United States in 1978 (Wheeler and Wheeler 1978). 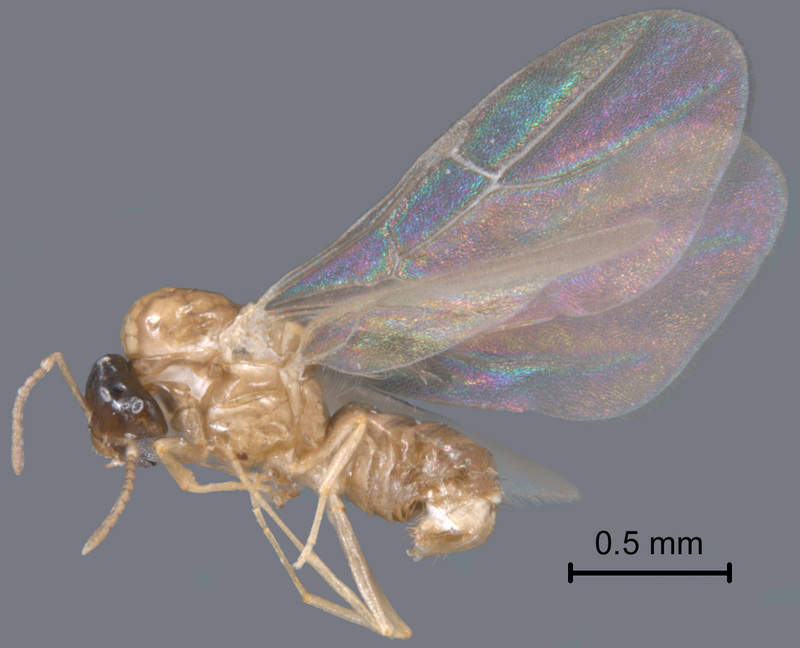 Note that this species has actually been in the US since at least the 1950's based on material collected by E.O. Wilson from Mobile, AL (Pers. Comm. Chris Wilson). Brachymyrmex patagonicus, which is the type species, was redescribed by Quiran et al. (2004). A recent publication by MacGown et al (2007) and a poster by MacGown and Hill (2007) presented the known distribution of this species (which appears to be rapidly expanding) in the U.S., figures of all castes, biological and pest status, and brief diagnoses of all castes. Described as Brachymyrmex patagonicus Mayr (1868); senior synonym of Brachymyrmex atratula, Quirán et al. (2004). Brachymyrmex patagonicus is most similar to B. obscurior, another exotic species. It differs in the size of the eye, which is much larger in B. patagonicus than in B. obscurior. Additionally, the males of these two species are different in color. Males of B. patagonicus are bicolored with the head and gaster dark brown and the rest of the body (see photo above), including the appendages, being pale yellowish-brown. Males of B. obscurior are concolorous dark brown. 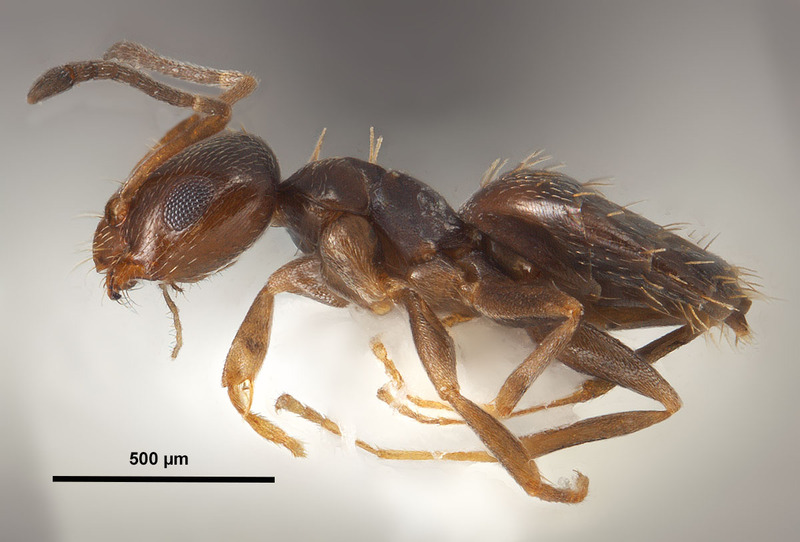 Brachymyrmex sp.-01, recorded from Florida, is also dark brown in color, but lacks erect hairs on the body. 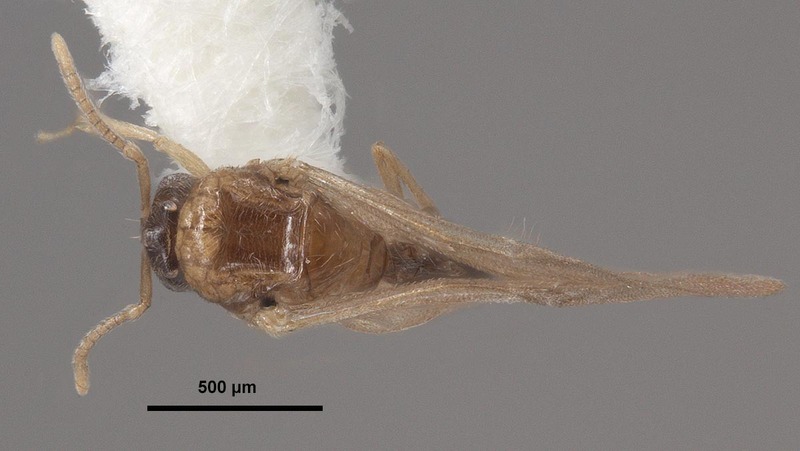 An undescribed brown species known only from two queens collected from Arkansas (Lloyd Davis, pers. comm.) is unusual in that the queens are tiny, about the size of typical workers. All other known species present in this region are yellowish in color. Worker: Minute: TL ≈ 1.50mm, HL 0.50-0.52mm, HW 0.43-0.48, SL 0.45-0.48mm, EL 0.15-0.16mm, MeSL 0.43-0.52mm (n=15) (MEM specimens). Head and mesosoma medium brown to blackish-brown, gaster usually blackish-brown, often darker than head and mesosoma, tarsi and mandibles pale, and antennae brownish-yellow. 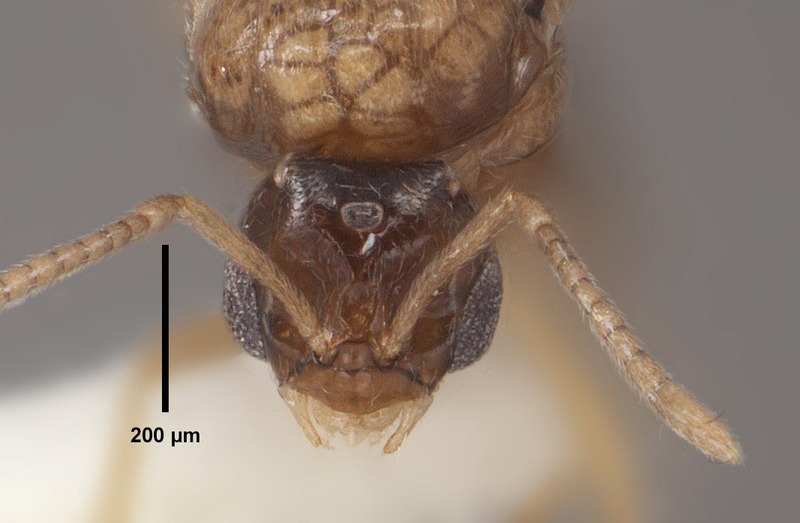 Head slightly longer than wide, covered with fine pubescence, and with a few longer erect setae; antennal scapes surpassing occipital border of head by 1/5 their total length; eyes relatively large, about as long as length of malar space and placed at approximately the middle third of side of head; 3 ocelli absent (possibly present in some specimens). Promesonotum with 3-9 (usually 4-6) stout, erect setae present dorsally, with fine pubescence that does not obscure the shiny sheen of integument. Mesosoma shining with a fine pubescence and three to nine (usually four to six) stout, erect, dorsally located setae. Waist is one-segmented; pedicel often obscured by overhanging gaster. Gaster with scattered, long, erect setae, especially along the edges of the tergites, and with sparse, decumbent hairs, separated by about 1/3 to 2/3 their length; acidophore present. Queen. About three times larger than worker: TL ≈ 4.0mm. HL 0.74-0.75mm, HW 0.73-0.76mm, SL 0.62-0.67, EL 0.27-0.30, MeSL 1.24-1.42mm (n=15) (MEM specimens). Concolorous light brown. Head about as wide as long, with abundant, fine pubescence, and with long erect setae present; large compound eyes located at middle of side of head; three large ocelli present; frontal lobes well developed; scapes surpassing occipital border by 1/4 their length. Mesosoma with moderately dense, fine pubescence, and 30-40 long erect setae (about 3-4 times length of fine pubescence); anepisternum and katepisternum separated by a distinct suture, with erect hairs present. Forewing with pterostigma; hind wing with 7 hammuli. Waist is one-segmented; node of the pedicel with an almost flat anterior edge and often obscured by the overhanging gaster. Gaster with moderately dense, fine pubescence, and erect hairs along apical edges of sternites and tergites; acidophore present. Male. About the same size as worker: TL ≈ 1.5 mm, HL 0.32-0.37mm, HW 0.32-0.37mm, SL 0.24-0.29, EL 0.17-0.20, MeSL 0.80-0.84mm (n=5) (MEM specimens). Head dark brown to blackish-brown, rest of body, including appendages, very light brown. 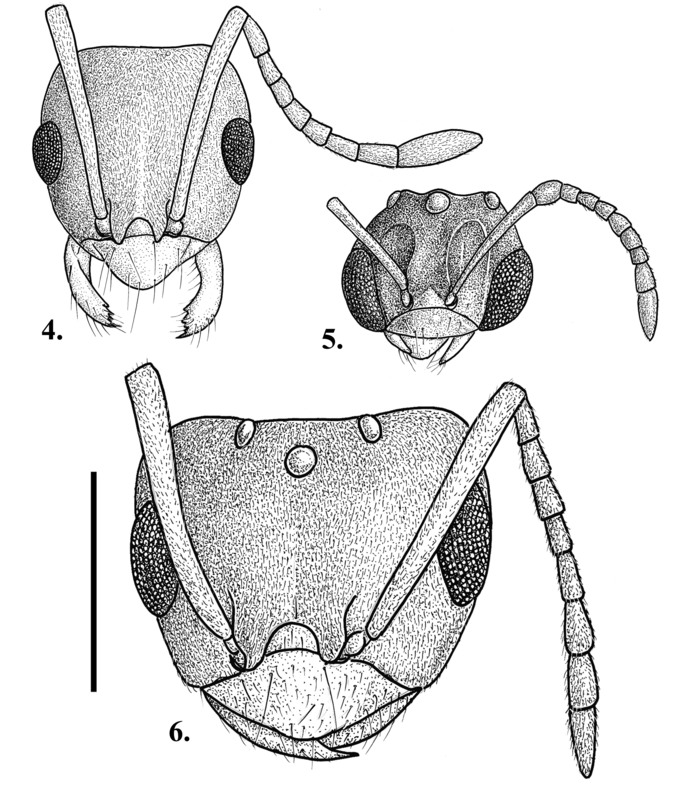 Head about as wide as long, with fine, sparse pubescence, lacking erect setae except on mouth-parts, and with smooth, shiny integument; frontal lobes reduced; distinct longitudinal depression starting at the antennal insertion point and continuing posteriorly to just before the ocelli; eyes large, at least 1/2 the length of the head; three large, raised ocelli present; antennae 10-segmented with the first funicular segment enlarged, almost globular, wider than succeeding segments; scapes surpassing occipital border by more than 1/5 their length. Mesosoma with sparse pubescence and shiny integument, lacking erect setae. Hind wing with 5 or 6 hammuli. Waist is one-segmented; pedicel with small pointed node. Gaster shiny, lacking pubescence, with scattered erect setae on last few sternites and tergites. 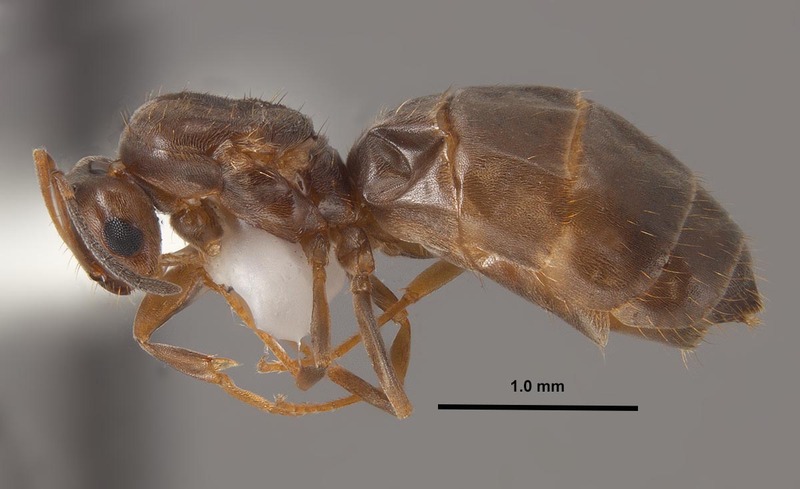 Brachymyrmex patagonicus is considered a nuisance pest, primarily because alates and foraging workers may enter houses, hospitals, schools and other man-made structures to forage and/or nest (MacGown et al. 2007). The species can occur in very high numbers, especially in metropolitan areas, and pest control operators have expressed difficulty controlling it. Joe MacGown has had calls from pest control operators in central Mississippi and Florida who have expressed great difficulty in controlling this species even with repeating applications as many as 15 times! Pest control operators have stated that although this species has been found in various food sources, it seems to be especially attracted to sweet liquids. So far, there are no reports of B. patagonicus causing structural damage, bites or stings (member of this subfamilly do not possess a stinger), or transmitting disease. Nearctic: United States (antweb.org, antwiki.org and MEM). Neotropical: Argentina, Brazil, Paraguay (antweb.org). U.S. Distribution: AL, AR, AZ, CA, FL, GA, LA, MS, NC, NM, NV, SC,TN, TX (antweb.org, Keefer 2016, and MEM). Southeastern U.S. Distribution: AL, AR, FL, GA, LA, MS, NC, SC, and TN (antweb.org and MEM). Thanks to James G. Lewis for help with some of the photographs and to Ryan J. Whitehouse for help with measuring specimens, comments on descriptions, and proofreading. Funding for the ant work being done by the MEM in Alabama and Mississippi is from several sources including the National Institute of Food and Agriculture, United States Department of Agriculture, under Project No. MIS-012040, the Mississippi Agricultural and Forestry Experiment Station at Mississippi State University, with support from State Project MIS-311080, NSF Grants BSR-9024810 and DFB-9200856, the Tombigbee National Forest (U.S. Forest Service), the Noxubee Wildlife Refuge, Mississippi Natural Heritage Program Research Grant, USDA Forest Service Agreement No. 08-99-07-CCS-010, the William H. Cross Expedition Fund, and primarily by the USDA-ARS Areawide Management of Imported Fire Ant Project (2001-2014) and USDA-ARS Areawide Management Invasive Ants Project. Additionally, special cooperation has been provided by State Parks, National Forests, National Wildlife Refuges, the Natchez Trace Parkway, and from various private landowners in both Alabama and Mississippi. Bolton, B. 2015. An online catalog of the ants of the world. Online at: http://antcat.org. Accessed 1 December 2015. Dash, S.T., L. M. Hooper-Bui, and M. A. Seymour. 2005. The pest ants of Louisiana. A guide to their identification, biology, and control. Louisiana State University, Louisiana Agricultural Experiment Station, Louisiana Cooperative Extension Service, Pub. 2915. Keefer, C. T. 2016. 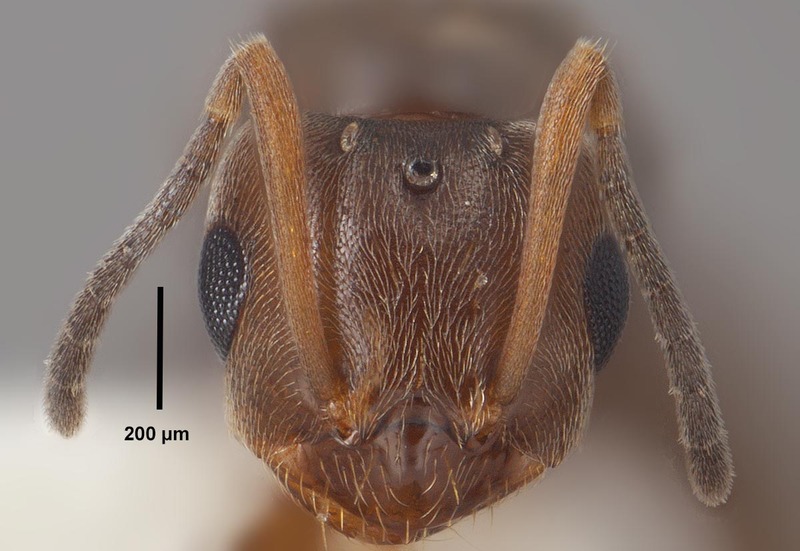 Biology, diet preferences and control of the dark rover ant, Brachymyrmex patagonicus (Hymenoptera: Formicidae), in Texas. Ph.D. Dissertation, Texas A&M University, College Station, TX. 114 pp. Mayr, G. 1868. Formicidae novae Americanae collectae a Prof. P. de Strobel. Annuario della Società dei Naturalisti e Matematici, Modena 3: 161-178. Quiran, E. M., J. J. Martinez, and A. O. Bachmann. 2004. The Neotropical genus Brachymyrmex Mayr, 1868 (Hymenoptera: Formicidae) in Argentina. 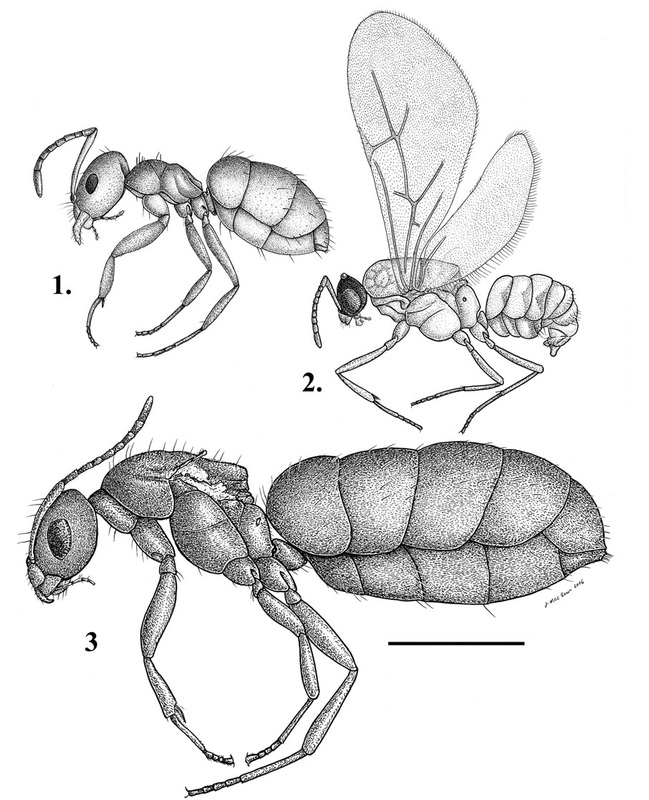 Redescription of the type species, B. patagonicus Mayr, 1868; B. bruchi Forel, 1912; and B. oculatus santschi, 1919. Acta Zoologica Mexicana 20: 273-285. Wheeler, G. C. and J. Wheeler. 1978. 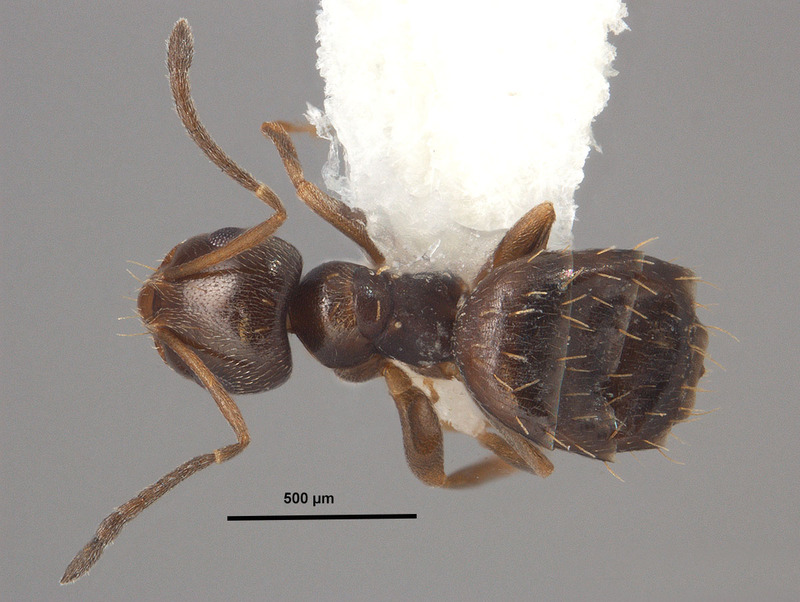 Brachymyrmex musculus, a new ant in the United States. Entomological News 89: 189-190. Wild, A. 2008. 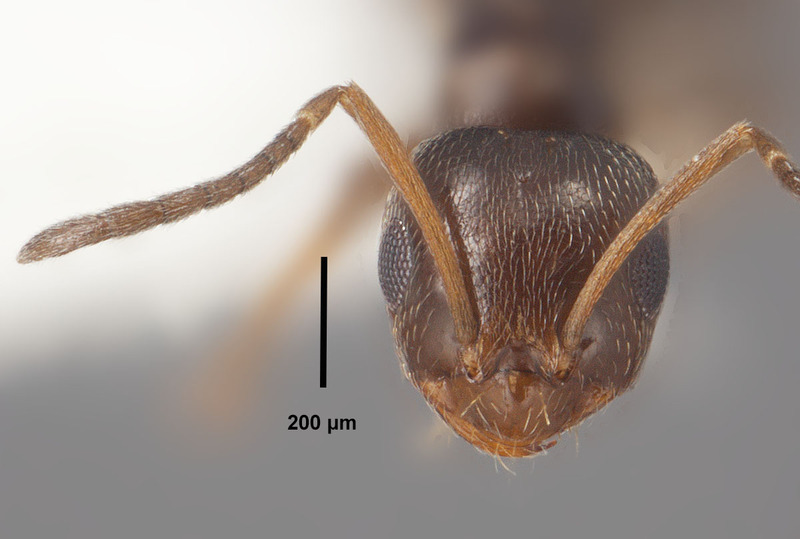 Myrmecos Blog: Rover Ants (Brachymyrmex patagonicus), an emerging pest species. http://myrmecos.wordpress.com/2008/05/27/rover-ants-brachymyrmex-patagonicus-an-emerging-pest-species/ (accessed 5 June 2008).